Click File > Open... to open any existing file into the XML Editor. 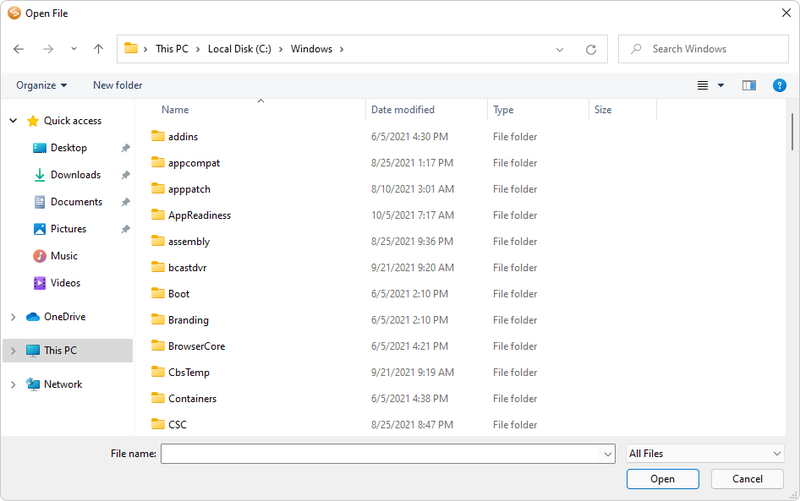 In the familiar Open File dialog, you can select more than one file to open. Use the Files of Type combo box to restrict the kind of files displayed in the dialog. • Look in -- Lists the current directory. Use the drop-down list to select another drive or directory. • File name -- Enter the name of the file you want to load or type wildcards to use as filters in the Files list box. • Files of type -- Choose the type of file you want to open. All files in the current directory of the selected type appear in the Files list box. Use the "ftp://" prefix to load a file from an FTP server, use the "http://" or "https://" prefix to load a file from an HTTP server. The Files view (View > Files) offers another way to open files in XMLBlueprint. Just navigate to the files you want to open and double click the files or drag and drop the files to the editors pane. • Windows Explorer: Click on any file icon. • FireFox, Internet Explorer: Click on the icon on address bar (in front of the URL) or on any hyperlink. • Outlook: Click on any e-mail or attachment. For more information on how to open files from a remote FTP, SFTP or WebDAV server, please go to FTP, SFTP and WebDAV. Click File > Reload to reload the active document. This is useful if an open document has been modified outside XMLBlueprint. If a modification occurs, XMLBlueprint asks whether you wish to reload the file. If you reload, then any changes you may have made to the file since the last save will be lost. Note: File > Reload is disabled if no active file is loaded in the XML Editor. Click File > Open Recent Document to reload a document that was recently loaded into the XML Editor. The list can contain up to twenty files. Note: File > Open Recent Docuement is disabled if no files are available.